In the calm and imposing extent of the Sahara Desert, enjoy the incredible experience of a camel caravan that takes you over the sand dunes at sunset and the silence and incredible mirages of the Chott El Jerid salt lake. The Chott is a great expanse of glittering salt where it is possible for one to journey 30 miles in the center of an immense and desolated area. Muddy in winter and covered in summer with a glittering, crackling crust, this is the season when fantastic forests and cities seem to appear on the horizon, only to be discovered as mirages. The oases and the chotts provide a strange, unearthly, unique atmosphere, an impression of infinite open space; A ground haze shimmers in the sun, and a far-distant camel train seems to be floating on air. Mirages of palm trees can sometimes be seen in the afternoon. 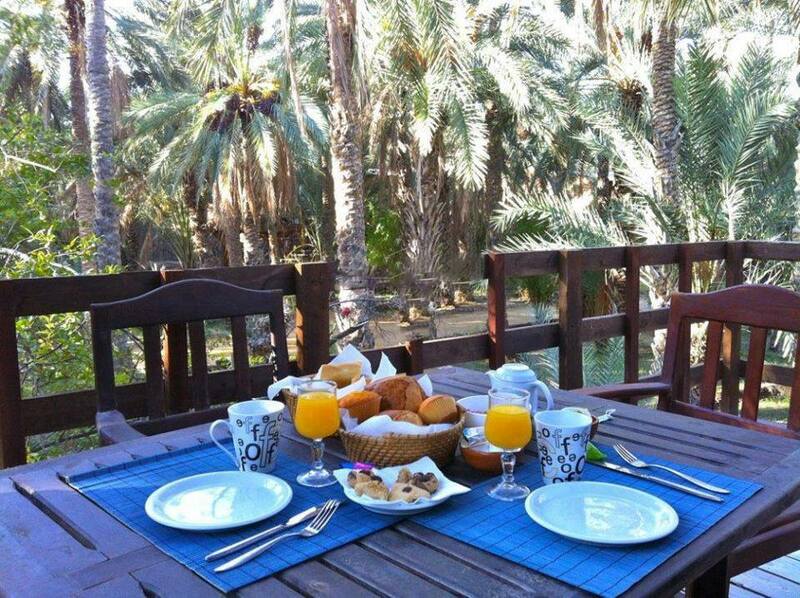 The main oases, which must have seemed visions of paradise to early travelers, nourish countless date palms. You will also discover species of flora and wild fauna protected by the law, agriculture techniques specific to the oases, clever systems of division and management of water, ksars of mountain which are citadel-refuges perched on rock pitons and the troglodyte homes in the form of houses dug in the ground on the side of cliffs. 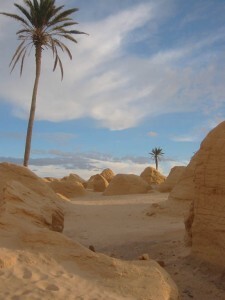 The easily accessible Gabès, site of a southerly seaside oasis which can be toured in a horse-drawn caleche, is also a port and a good base for excursions through the chotts to the inland oases of Gafsa, Tozeur, Nefta and Douz, or southwards to the Sahara and theMatmata Mountains. Gafsa is a city of rose-pink walls, whose warm thermal water spring bubbles up into three large Roman cisterns. Just out of town is a zoo displaying indigenous animals and birds, as well as the oasis, which can be toured by horse-drawn carriage. 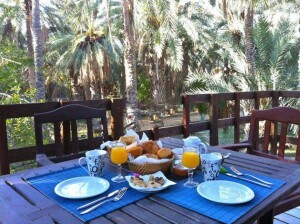 Tozeur has perhaps the most luxuriant oasis of all. Its 200 springs feed thousands of the best date-palms – each towering tree is said to need 3500 cubic ft of water a day. It can be toured by donkey or camel, and contains a ‘Paradise Garden’ profuse with exotic flowers and fruits. Tozeur’s town buildings are built with unfired yellow bricks picked out in geometric patterns similar to those found on Arab rugs. Nefta’s oasis resembles a bowl, and is known locally as a basket or ‘horn of plenty’. The town, made up of sand-coloured houses, is on a plateau above it. Guides are available for the trek on donkey back to the oasis. 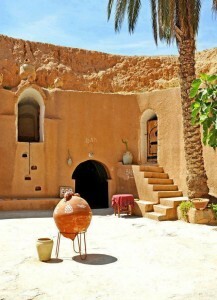 North of Tozeur and Nefta are the mainly mud-walled villages of Chebika, Tamerza and Mides. 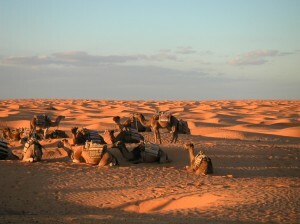 To the southeast, via Kebili, lies Douz, on the “Grand Erg Oriental”, the great sand-sea of the eastern Sahara. Its Thursday camel market is a camera-worthy event, as is the marhoul ceremony celebrating the start of the seasonal desert migration. 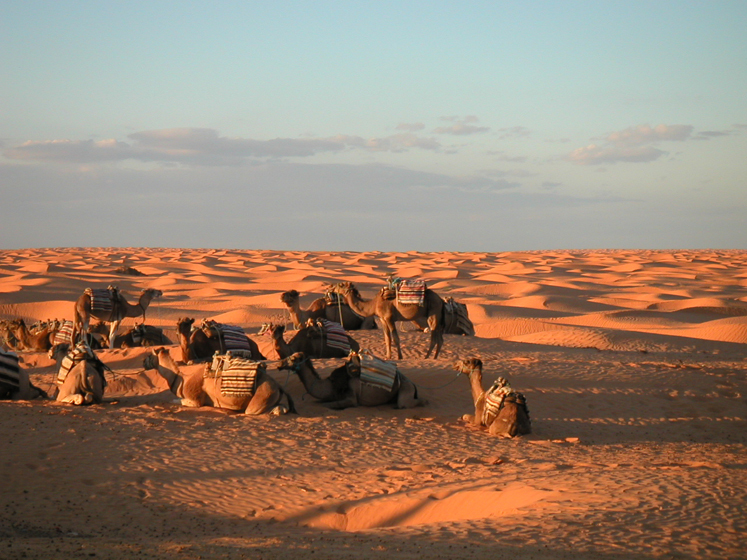 Such rituals – as well as camel-wrestling, poetry ‘jousts’ and folk dance and music – are incorporated into a Sahara Festival which takes place near Douz every January. 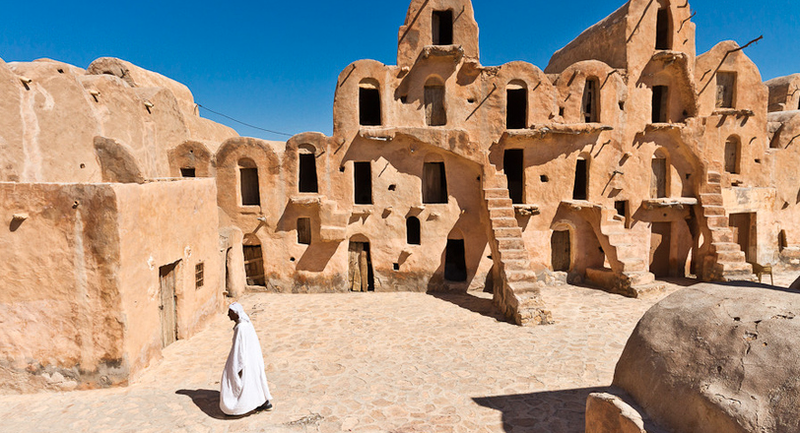 Around this region live veiled people of pure Berber stock. You may also find a ‘desert rose’ of crystalline minerals baked by the sun into petal-like formations. Matmata and Tataouine, locations used during the filming of ‘Star Wars’, consist (as do other Berber villages) largely of sizable holes burrowed into the ground, a useful defense against the fierce summer heat and cold winter winds. Their homes are built on two levels, the upper one containing storage rooms. In some cases, several of these underground dwellings have been connected together to make hotels and restaurants. Two of the most beautiful mountain ksars are Ouled Soltane, south of Tataouine, and Chenini, to the west. The road to Chenini is a memorable one, zigzagging through a cinnamon-coloured mountainscape. For walking enthusiasts and lovers of open spaces and exploring, Tunisia has a corner of the Great Eastern Erg of the Sahara desert that offers vast spaces for exploring and the emotion of tasting the nomad life.